It is brand new design Mindmaps Tool with all new sync. Sync all your maps and paper maps with iCloud account via CloudKit, which is much faster comparing to iCloud Drive. Now you can draw mind maps on *A PIECE OF PAPER*, and take a photo by iPhone camera. We scan the paper and save your mind map into your library. We love hand-drawing mind maps so much. So that we also provide hand-drawing style themes with hand-drawing style lines, topic shapes and even fonts. Fold & Unfold Fold several topics, focus on the real important information. You can unfold them anytime. Connect Customized line between any two topics to show special relation. Checklist Check the status of the tasks quickly with clearness. Note Keep the map clean and organized. Important messages will never miss. Lighten Make one or several topics stand out. Export to different format and share to friends anytime, anywhere. The all-new Lighten! 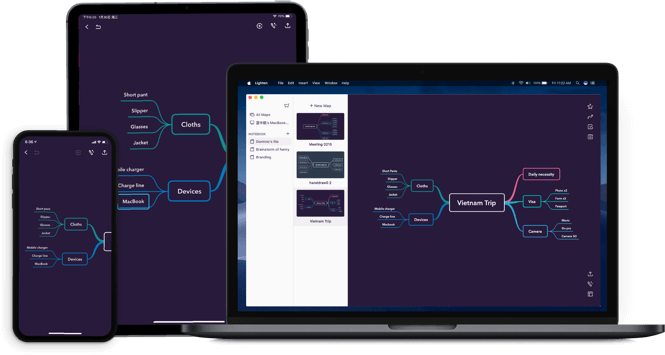 A complete rethinking of new design and the original cores of mind map softwares - with a perfect balance between aesthetics and functions, delightful interactions, amazing new features, and all-new design. More easy to use. The latest Lighten news, articles, and resources, sent straight to your email box about monthly. Subscribe now and never miss an issue.